Frankly, it’s just as well that Donald and Melania won’t attend the Kennedy Center honors again this year. I mean, who wants to see the honorees — including Cher and Lin-Manuel Miranda — scowl the whole time? 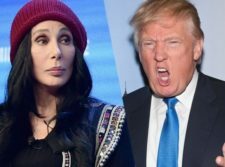 Yes, I know that Cher getting in the President’s face for real, instead of during their usual Twitter wars, could be a kick. But only for a moment. Spanish “West Side” Opens In D.C.